In our area, a good Solar Screen Austin TX supplier is important. 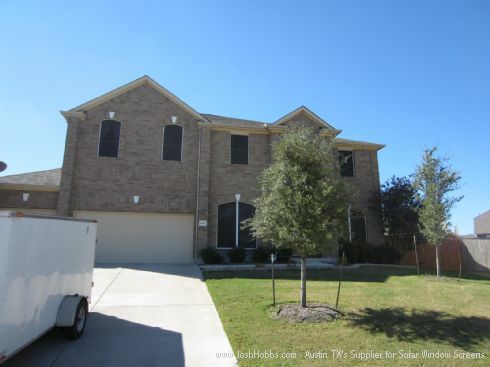 If you are moving to the Austin Texas area, be prepared for the long super hot summers we get here in Austin. It's that kind of thing that when you experience this unrelenting heat, that you just want to do what you can to get out of it, to find yourself in a much cooler place. Being hot is NO fun, and we have become accustomed to our nice air-conditioners, we don't like to be hot if we don't have to. Even with the help of an air-conditioner, the relentless 100+ degree day after day of heat proves to be too much for the air-conditioners. 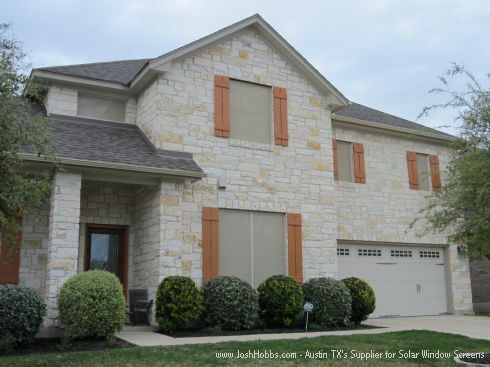 Now, if you live in a cave of sorts without any windows, it won't be as hot, but most homes in the Austin TX area are chalked full of windows. It's these windows that let heat in to a home. The sun's rays penetrate a window making the glass of that window HOT and everything else hot the sun's rays come in contact with. All of this heat radiates in to the home significantly contributing to the warmth within your house. The warmer it is in the house, the harder the air-conditioner has to work to cool off that warm air. The more the A/C has to work, the more electricity that is being used, which yields higher utility bills. 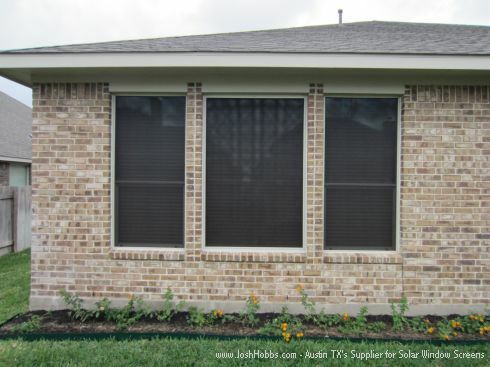 An Austin Solar Window Screen mounted on the outside of a window will serve as a shading device providing shade for that window. 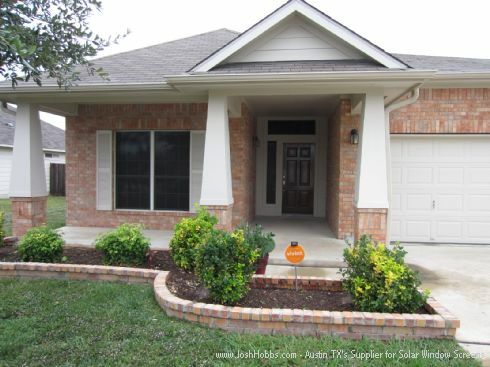 If the sun's rays can not come in contact with the window's glass to make the glass hot or get in to the home through the window because the windows are being shaded by our Austin Solar Screens, the windows nor the area around the windows will get hot. I tell people often that they can relate a warm oven to that of a warm window. Think of how hot that kitchen gets from a warm oven. That heat is trapped in that oven, but the glass gets hot, therefore that hot glass acts as a heating element in your kitchen. With windows all around your home not being shaded by solar screens, you have heating elements all over your home just like that of the kitchen. Solar Screens will eliminate these windows form getting hot, keeping that heat from the sun out of the house. 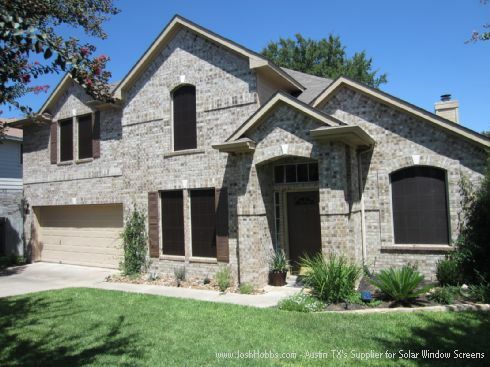 Solar Window Screens will keep the Sun's Heat out of your House ! Some people think they can put blinds or shutters up to provide the needed shade for the inside of their home. Yes, you need blinds or shutters for things like evening privacy, but as far as helping the inside of your home stay cooler that just isn't the case. Sure the sun's rays are not pounding things like furniture or the floors making them hot with blinds and shutters in the closed position, but what is happening is the sun's rays are now pounding the back side of the blinds and shutters, making them SUPER hot. Basically with the blinds and shutters you are somewhat trapping the heat between them and the windows. Go touch your blinds that are getting hit by the sun, they are SUPER hot. 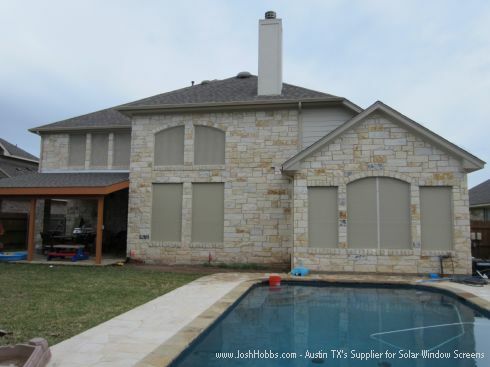 With our Austin Solar Screens, the sun's rays never get a chance to heat up the glass or the blinds and shutters. The sun's rays will not find their way in to the home at all. And, as an added benefit to having the solar window screens, during the day you will now be able to open those blinds and shutters, as the windows will be shaded from the outside by the solar screens. 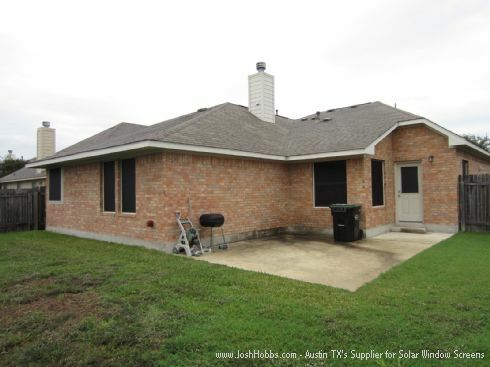 Not all Austin Solar Screens are the same, and by no means are all of Austin's Solar Screen installers equal in their craft. 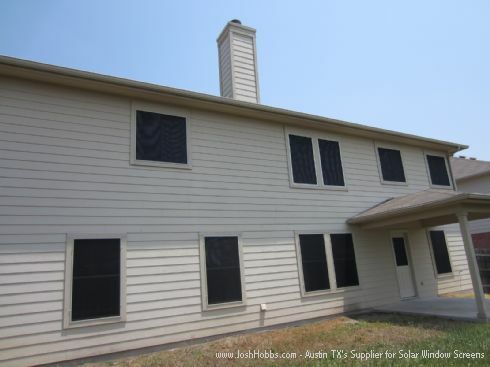 All over Austin I see Solar Screen jobs done by other installers that I just cringe at the site of. It saddens me to see these jobs, and truth be told I seem to always ask myself, "did they not know about JoshHobbs.com Solar Screen Services"? If they did, what were they thinking? 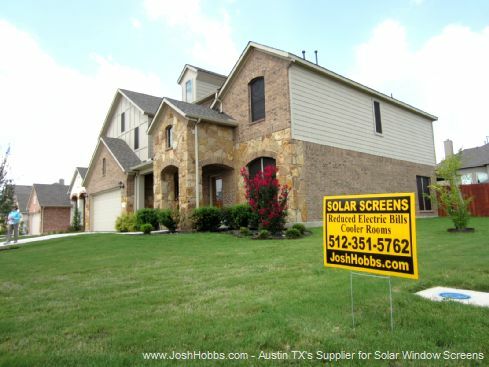 Our installed Austin TX Solar Screen pricing is SOOO inexpensive that it just doesn't make any sense to me to gamble with anyone else when you know for sure you will get the best job possible with (me) Josh Hobbs. On my website I have three hundred plus reviews written in to me from some of our customers, please take a few moments to read through some of these reviews. 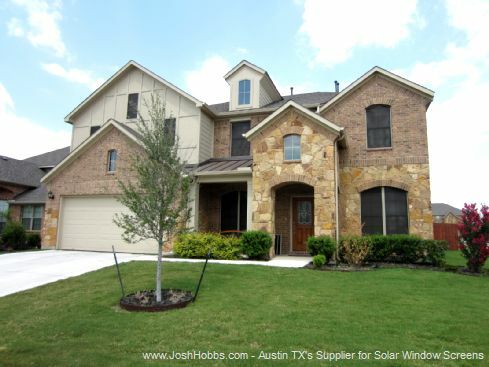 Once you have read through a few, it'll make it hard to argue against using me as your Solar Screens Austin Texas installer. 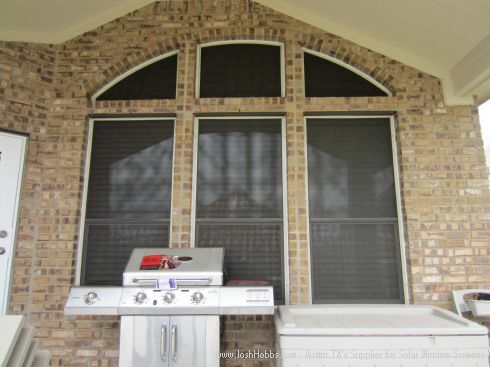 We put solar window screens on every window of this customer's Austin TX Texas home with the exception of these three small arched windows that you see here at the front of the home. One over garage, dormer window, one over front door (entry). 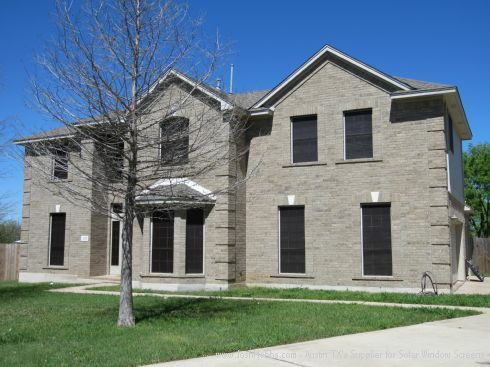 See how odd this home looks with those three windows not covered with solar screens? We tried to convince the customer to put solar screens on those windows and he didn't want to. He said it wasn't necessary. Granted one goes into the garage, one goes into the attic and one goes into just the entryway of the front of the house. He's right. From a heat aspect or from a shading aspect, screens were not needed for these windows. But from an aesthetic aspect, it would have been wise to go ahead and cover those windows, in my opinion. 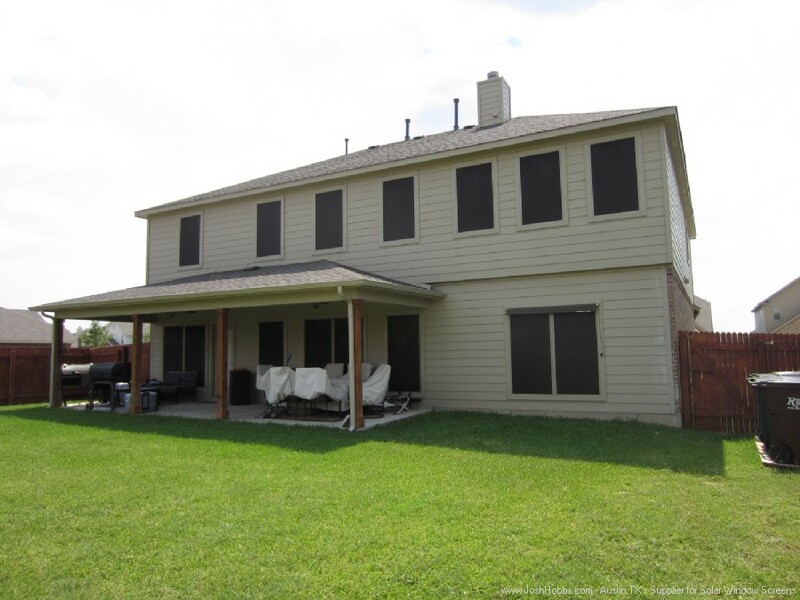 We put solar screens on the front, left, back and right side of the home. We put the chocolate fabric with the tan frame. The windows of this home are made with the tan frame. The window frames of this home are tan in color so we matched it with our solar screen framing. Our solar screen framing is tan, which is the same as the windows.